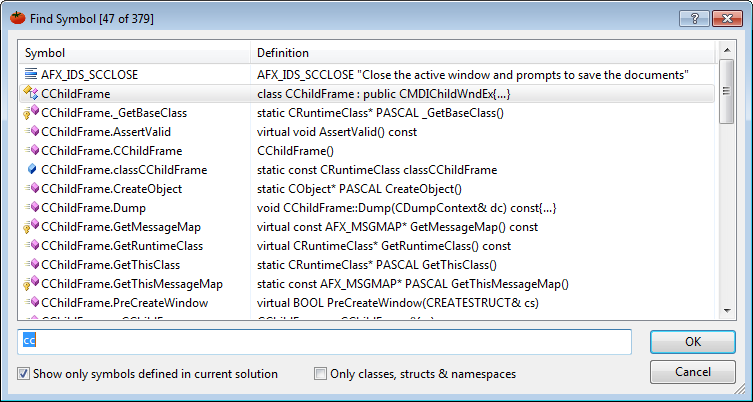 Visual Assist X is a code refactoring and code navigation add-in for Visual Studio. For C++ developers like myself this is the best productivity booster. 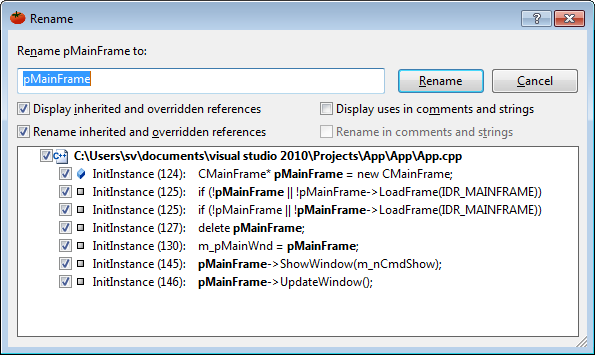 I started to use Visual Assist with Visual C++ 6 and up to Visual Studio 2010 it constantly helps me write new code faster and understand existing code better. VAX has its own C++ parsing engine that comparing to built-in Visual Studio IntelliSense for C++ is faster, more accurate, handles complex codebase like Boost and supports C++/CLI. VAX provides function and variable name autocompletion and even suggestions for known contexts. For example, when you are writing an assignment to a variable or passing a parameter to a function, required variable type is known and VAX offers local variables with matched type. When assigning to an enum variable VAX offers enum values. Configurable VA snippets provide templates for constructs like switch cases, for loops and also let you wrap selected code to try-catch and other blocks. The Find Previous by Context and Find Next by Context commands let you navigate to the previous/next variable or function usage in the current file. The Open Corresponding File command lets you switch between corresponding h and cpp files. The extended Paste command keeps clipboard history and lets you store several code fragments for copy and paste operations. Spelling errors and mistyped symbols are underlined as-you-type. This entry was posted in Reviews and tagged C++, Visual Studio 2008, Visual Studio 2010, Visual Studio 2012, Visual Studio add-ins, Visual Studio extensions. Bookmark the permalink.